More Canadian Folk for Children! After the birth of his twin daughters in 2006, Boston's folk musician Alastair Moock  turned his attention to kidz music. The Grammy-nominated album Singing Our Way Through grew out of songs co-written with one of his daughters after she was diagnosed with leukemia in 2012. To fight the everyday terror with music, Alastair wrote and collected songs that reflected our experience — the love, the pride, the surprising amount of joy, and some of the struggles too, and recorded it with the help of friends such as Aoife O'Donovan  and Elizabeth Mitchell . Singing Our Way Through is no happy-go-lucky family album but could be a sincere choice for families and kids sharing a similar fate. 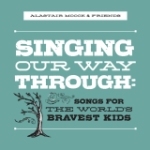 Alastair Moock, Singing Our Way Through: Songs for the World's Bravest Kids. Moockshake Music, 2013. And the CD in this issue is another fine example of good Canadian folk for kids. 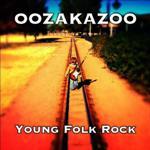 Oozakazoo from Toronto have their new CD entitled Young Folk Rock - it does not necessarily do what it says on the tin as I would have described the style as a blend of Country and Bluegrass, with just a hint of folk rock in it. But that doesn't matter as the result of the music is excellent. The band around Noah Aiken-Klar & Joshua Skye Engel play new children's songs. Some of the songs are very obviously children's songs – like “Simon Says” based around the game, or the great “When I am happy”. In other songs one has to listen more to the lyrics to reveal the children's themes to songs which sound otherwise as suitable for grown-ups as for kids. The music has a great feel to it – it's a full band sound, with some great singing. The children are always happy to listen to this CD. I found myself listening to the album without any children in the car and not wanting to change it round – which shows the appeal this album has on adults like me. Their Twitter site states that Oozakazoo “creates family-friendly songs, colourful characters, and meaningful stories for kids and the kids in all of us” which is actually a very good summary of their music. A wonderful CD for the whole family. Photo Credits: (1)-(2) CD Covers (from website).